In a strange twist of fate, it turns out it was me and not the Joker working on VBC’s 100th house this week. But I can’t take any credit for it’s construction — I certainly wasn’t building. 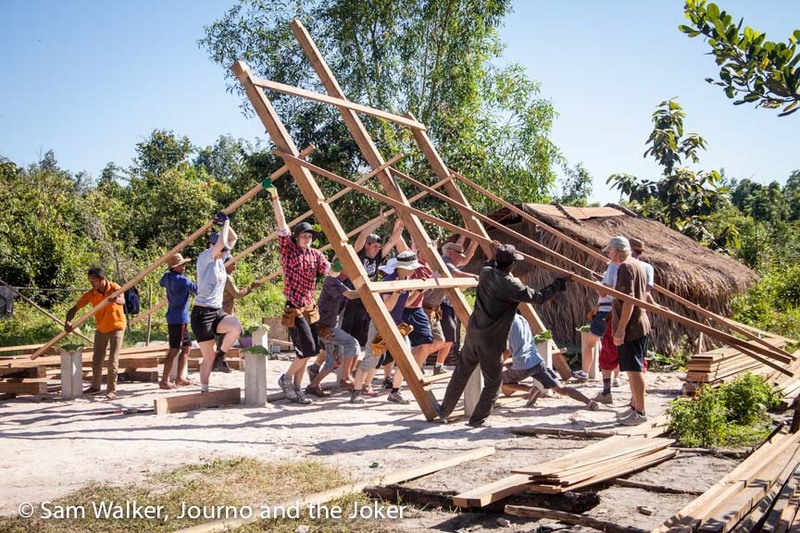 Mr Sinn asked me to photograph the progress of Volunteer Building Cambodia’s 100th house from beginning to end so I headed out with the volunteers on three separate occasions this week to record the various stages of building. 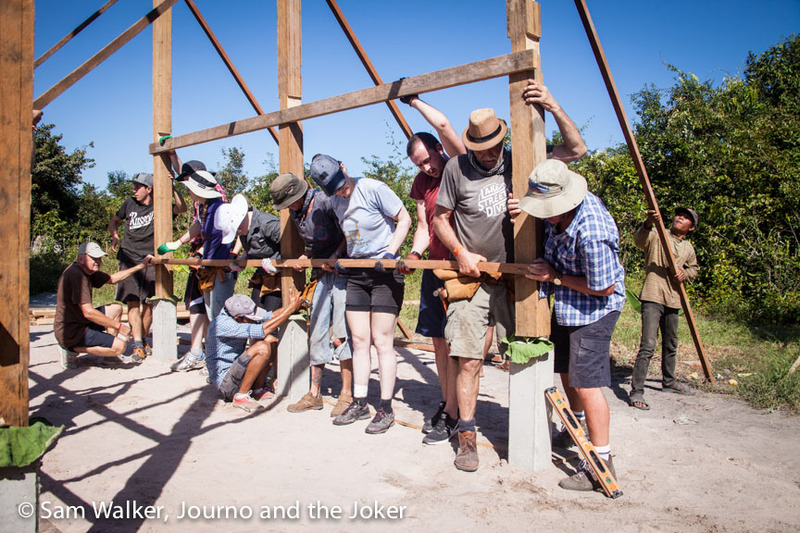 Meanwhile the Joker was starting a new VBC milestone, working with a group of volunteers on the 101st house. This small, dark, palm leaf structure has been home to 29-year-old Phon and his wife Ray (28) for five years. They lived in this humble dwelling with their four- (or maybe five) year old son, Lyheang, where two wooden platforms are all that kept them from the earthen floor. A cooking pot sits on a fireplace in the corner of the shelter, smoke from it’s wood fire seeping into the small space and curling around the gaps in the walls that mark doorways — there are no doors — and escaping through the holes in the leaf walls. Two weeks ago they welcomed their daughter Weuchagaa into the world. A hammock is slung across the corner of the shelter above one of the platforms where the baby rocks to sleep in the smoky room. There is no electricity here and certainly no plumbing. And this family does not have access to a toilet. The couple are simple farmers. They work in the rice fields, harvesting rice for other people. Sometimes they harvest a root vegetable Cambodians call potatoes. It is mostly seasonal work, providing a sporadic income. With the pregnancy and the new baby, Ray is not working, taking a toll on the already meagre family income. When they both work they can make about $8 a day together. Like parents everywhere they are hoping they can provide a better future for their young children and opportunities they did not have. Simple opportunities, that most of us in the western world take for granted, like an education and the ability to read and write. And enough food to fill their tummies. Neither Phon nor Ray can read or write and money for food and other necessities is often a scarce commodity. Their small home is surrounded by trees and vegetation but they say they need to buy all their meat and vegetables because they do not have a water supply for them. 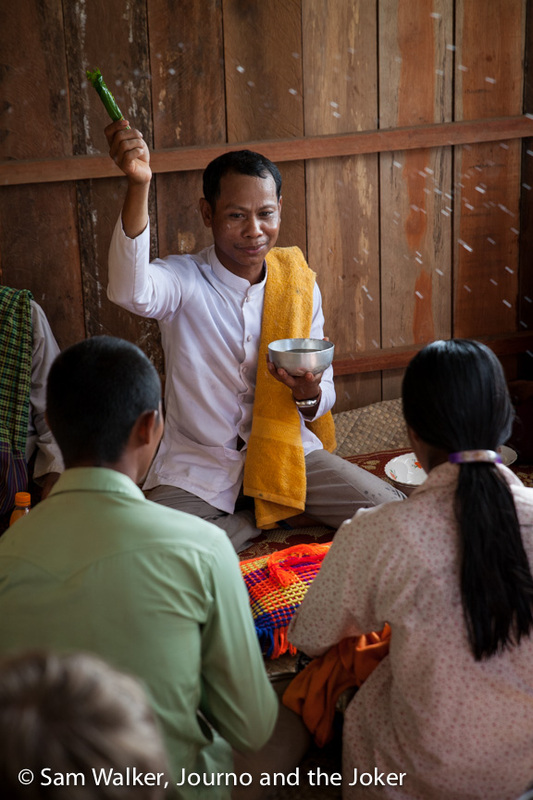 They source their household water, for washing and cooking, from their neighbour’s well (Phon’s brother). But they say it is not to be used for watering plants. They are so happy about receiving a new house. It means their living conditions will improve. But, like so many they are still worried about their work opportunities. Ray says she wants her children to have an education and not have a life as hard as hers and Phon’s. Both would like to see more jobs available to them and the chance to work harder and earn more money. Their smiles were bright when the keys to their new home were handed over, just before the house was blessed on Friday morning. 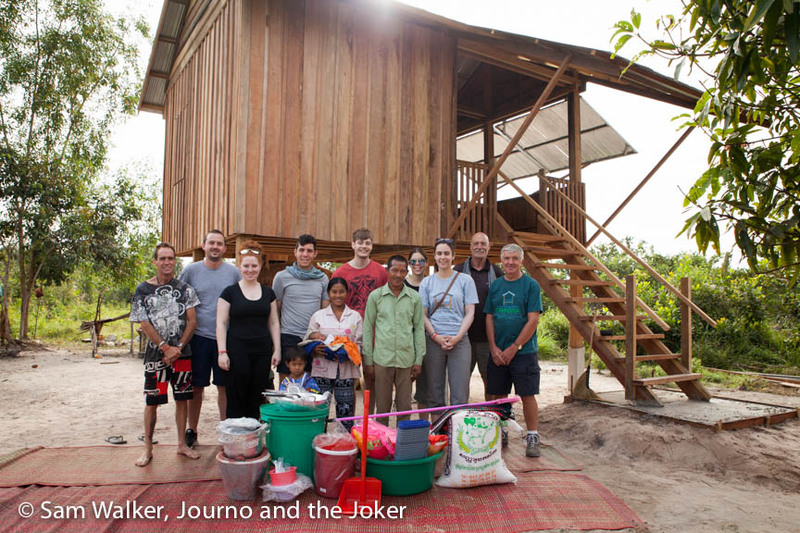 It’s really an impressive accomplishment — 100 sturdy, quality houses built by the Volunteer Building Cambodia team in less than three years. And house number 100 was made possible thanks to Australian man, Karl Maughan. Karl and his family have been big supporters of VBC and this year he also started Karl’s Cambodian Cow Club, KCCC held a successful fundraiser, which paid for house 100 plus another house. Many thanks to Alexis Southern and Marie Bell, who were major contributors. This wonderful Khmer-run organisation is focussed on supporting poor Cambodian families and giving them a hand-up. 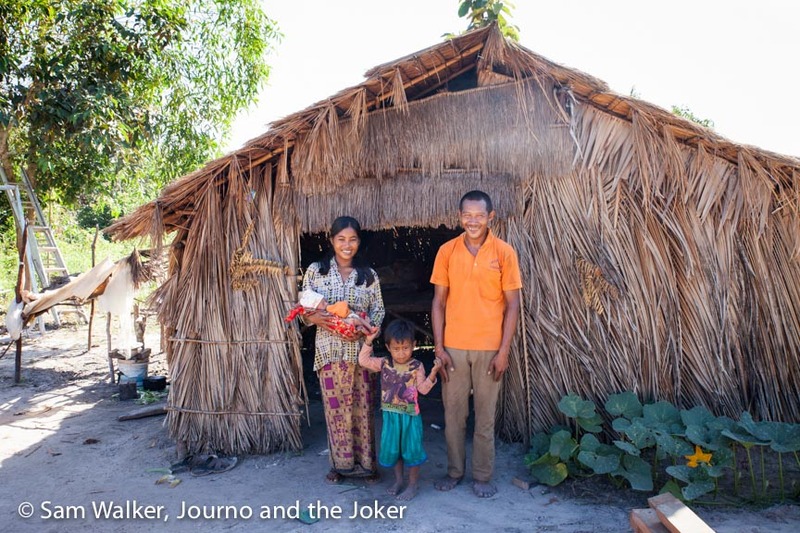 The simple stilt houses provide shelter and security, protection from the elements and generally make life a bit easier for the families who receive them. Each house costs $2900. It is built of timber with a tin roof and concrete stumps. 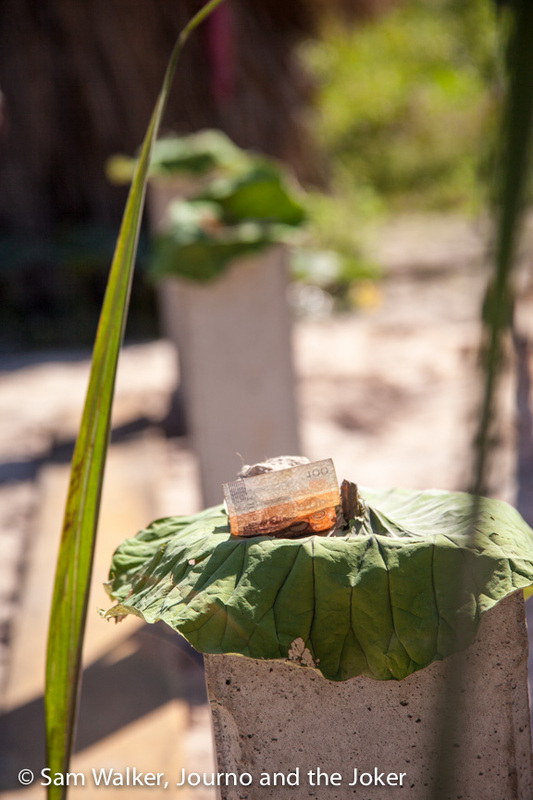 A blessing ceremony takes place before the house frame is erected and money is placed on each of the concrete stumps for good fortune. The houses are built high in traditional Khmer style to keep them above any potential flood waters in wet season and to allow a breeze to pass under and around, helping to cool it a bit. The family often sets up a kitchen or hammocks under the house and uses it as an outdoor living area. The homes are simple by western standards but strong and durable, expected to last about 15 years and not just one or two years like the palm frond homes. Families who have received homes have reported feeling more secure, with less stress resulting in better school attendance for the children and generally better living conditions. A house blessing takes place at the end of the build, before the family moves in to the home. 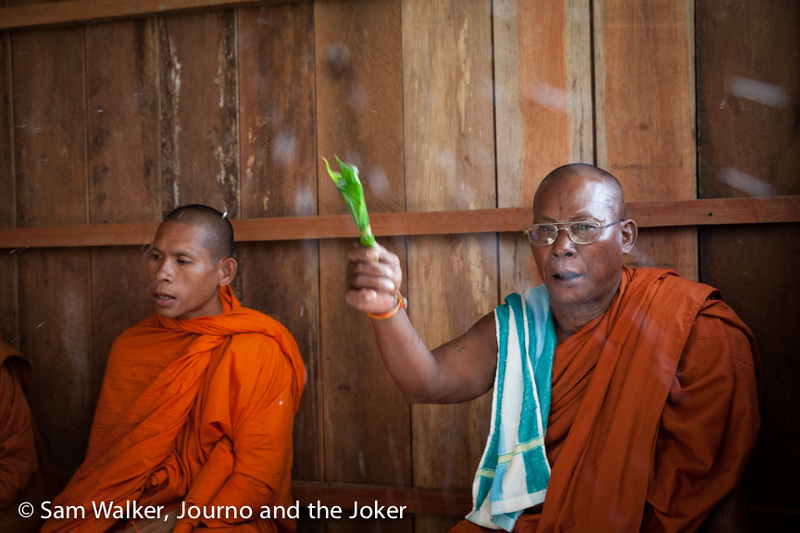 A senior man from the village does the first part of the proceedings and the monks do the last part. It’s been quite a journey for Sinn and his team, starting with one builder a few years ago. In that short space of time, the organisation has grown, employing three builders, a social worker and a volunteer co-ordinator. And it has expanded with the construction of a warehouse and community centre. Men from the villages they have built houses in are employed to help at the warehouse. A community centre manager has been appointed, classrooms have been built and English lessons will start at the centre in a few weeks. VBC builds houses where there is a need. But the majority of houses have been in villages 30 or 40 kilometres north of Siem Reap — an area where few NGOs are operating and families are incredibly poor. The organisation’s main focus is to build houses. But when funding allows they also build wells and toilets. A huge congratulations to Volunteer Building Cambodia for all that it has achieved and to the wonderful team that keeps everything going. It is a fantastic effort and the Joker and I are both pleased we’ve been a part of this organisation and contributed in a small way. Here’s to the next 100 — well 99 — houses and the success of the new community centre, VBCC. VBC is not just building houses — it’s building futures. This is fabulous. We work with an organisation in Siem Reap and visit every year. My husband would love to help with building, I am sure. Hi Melissa, that’s great. Steve finds the building very rewarding and very humbling. You should definitely check out VBC. We visited this area when I was working with Destiny Rescue in 2010 and some of the children are walking 5kms to school and home each day. Some very poor farmers in the area indeed. I hope that this family have the opportunity to educate their children to give them a chance at a better future. Destiny Rescue is a fabulous organisation. And yes, there are some very poor people – most of them farmers – in this region. The little boy from this family is attending kindergarten, so hopefully he will continue all his schooling. This was very special for me to read as I am one of the facilitators of house 100. I will be visiting Cambodia in july 2017 to help build what ever house is being built at that time. I am looking forward to visiting house 100 and now thanks to your blog I can visualize the family that live in it. So exciting to know the family dynamics and can plan what to take over for the children. Congratulations! What an amazing thing to be part of – a house build for a family in dire need. You obviously played such an integral role in making this happen. Glad you enjoyed the post and I’m sure you will have an amazing time being part of a house build in July. I’m so happy for this family. What a wonderful organization.